‘Trataka’ is a Hatha Yoga method to develop concentration. It is a simple, yet powerful practice, which form part of the six purification methods in Hatha Yoga. The technique involves gazing or fixing the eyes on one point, either on an object or on a candle flame. Scientifically, the practice of Trataka, involves the movement of eyeballs, which in-turn reflects our thinking process. When we concentrate on an object, our thoughts are focused on that alone, and everything else may vanish. The eyeballs too become steadier. There is a definite link between our eyeball movement and mental state. This is the principle that is applicable when practising Trataka. When we compulsorily fix our gaze on a particular point, we can induce a steady concentrated mind. Our thoughts become less turbulent, and our mind can be brought under control. The practice is done with open eyes focused on an external object, which then progresses into internal practice, and to gazing the void. There are many types of Trataka. Practitioners use various objects for doing steady gazing. These may be ‘flame of a candle’, ‘a black dot on the wall’, ‘the crystal ball’, ‘the picture of your favourite diety’, ‘the sun or the moon’, etc. However, the most commonly followed technique is gazing on the candle flame. Sit straight in a relaxed manner on the floor or on a chair. Place a burning candle, or the object you wish to focus on, at a distance of one or two feet away from the eyes. 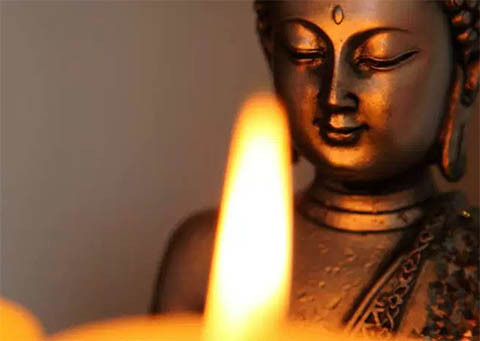 However, ensure that the candle flame is at the same level as that of the eyes, so that you can gaze straight at the flame without having to tilt your head upwards or downwards. Now keep your body steady and gaze at the bright spot of the flame just above the wick. Do not focus on the top of the flame, as the flame may flicker and you will lose focus. Gaze at the flame without blinking the eyes. With practice, you can progress from few seconds to few minutes without blinking. With practice, you will notice that you are aware only of the flame, while the rest of the field including the body goes into oblivion. The practice time should only gradually build from few seconds to minutes. When your eyes get tired, slowly close the eyes and relax. Sometimes the eyes may water. Keep the eyes closed till the strain is relieved. Try to see the image of the flame in the space in front of the forehead. View this internal flame as long as it appears. Now, slowly open the eyes. You may blink a few times to relieve any strain. • Repeat this process a few times. A candle is the preferred object, as fire is like a magnet for eyes and mind. It leaves a clear after-image in the mind. After practicing with a candle for a couple of weeks, you can break from the practice and swap to another object. It is advisable not to practice trataka for more than 10 minutes, unless you have an experienced teacher to guide you. Ensure that the object you are focusing on is at eye level and is clearly visible without any blurr. It can also be practiced wearing your glasses. If practising this using a candle, make your room completely dark, and ensure that there is no wind. For other objects dim light is preferred. The source of light should be behind you. Try not to blink, but don’t try too hard. Do not strain your eyes. In case you experience discomfort, then blink the eyes and continue the practice. But don’t move the pupils. Through the practice of Trataka, the attention and power of the mind is channelled in a continuous stream. It is considered as a highly effective concentration technique. In fact, the ancient yoga manuals say that ‘Trataka’ destroys eye diseases and removes sloth. Trataka is good for the eyes. It strengthens the muscles surrounding the eyes, helps in getting rid of mild eye problems like short sightedness etc. Trataka prevents insomnia. Practice of Trataka a few minutes before sleep can actually improve the quality of sleep. More than anything, Trataka completely removes distractions in the mind. It makes the mind calm, steady, and increases concentration immensely. Trataka practice also helps improve memory. Therefore, it is highly recommended for school children. It develops intuition, the ability to visualise and develops willpower. Trataka is also believed to improve mental and nervous stability, improves cognitive functioning, calms anxiety, balances the activity of two hemispheres of the brain, improves vision in the dark, instils self-confidence and patience, and has a soothing effect on the cranial nerves. This exercise is not suitable for people with psychic problems. Therefore, those who suffer from Schizophrenia or hallucinations should not practice Trataka. Also do not practice trataka on a candle if you have cataract, glaucoma, myopia, astigmatism or epilepsy. Next Post Next post: What is the Ayurvedic Treatment for Herniated Disc in the Lower Back?